TAIPEI, Taiwan, Feb. 1, 2019 /PRNewswire/ — The “most innovative distillery tour” — outside of LA — can be found at the home of Kavalan whisky in Yilan, Taiwan according to Drinks International. Free-of-charge tasting of Kavalan whisky every hour on the hour in the dramatic Spirits Castle and double-ceilinged Great Hall. DIY Blending Lab where visitors can blend their own personalised whisky and take home an individually labeled bottle. The rugged Scenic Yilan Coast where Siberian winter winds contribute to Kavalan’s extended oxidation period and unique ageing process. Kavalan Cooperage a corridor in plain view from the exterior offering glimpses of skilled coopers carrying out procedures such as Kavalan’s groundbreaking Shaving, Toasting and Recharring technique, fundamental to the Solist Vinho Barrique, the 2015 World Whiskies Award’s “World’s Best Single Malt”. The hugely popular Mr. Brown coffee shop, looking down on the Great Hall, where entire meals are served as well as two delicious versions of the “Taiwanese Coffee” — Kavalan’s take on the “Irish Coffee”. King Car Mr. Brown Castle perched atop a cliff with unforgettable views of Yilan’s natural emblem, Turtle Island,* an active volcano. Kavalan’s water source, Snow Mountain’s mineral-rich water, is naturally filtered through Yilan’s rich volcanic soil producing Kavalan’s signature fruitiness. King Car Orchid Orchard where visitors can taste our whiskies among the hundreds of orchids, the local inspiration for Kavalan’s floral notes. Kavalan CEO Mr. YT Lee said the core distillery tour and hourly tastings were free of charge in line with his ethos of sharing Kavalan distillery with the community. He said his expectations of the tour was it told the full story of how Taiwan’s first whisky came into being, as well as how it’s made. “I want this to be an experience visitors will take away with them,” he said. Master Blender Ian Chang said there were plenty of extra opportunities to taste Kavalan in more depth. 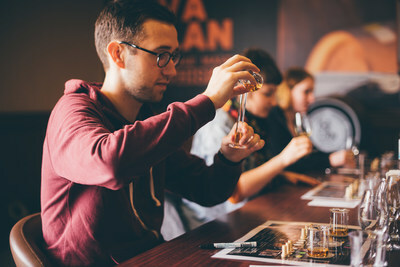 The customised Tasting Lounge has a luxury whisky bar, where expert guides will take visitors on a “taste journey” through a choice of four of Kavalan expressions, depending on their preferred tastes and textures. “And if visitors want to try their hand at my job, they can create their own whisky with a personalised label to take away from our DIY Blending Lab. With all this on offer, we look forward to seeing you at Kavalan distillery in 2019!” Mr. Chang said. Kavalan’s Fino Sherry Cask Strength was also given 91 points by CigarsLovers Magazine -among the highest scores awarded – out of all the whiskies the publication has tasted over the past 12 months. In the 2019 Annual Brand Report, Kavalan once again proved a strong favourite in both the Best Selling and Top Trending world whisky categories, according to Drinks International. Kavalan has also won the Icons of Whisky Visitor Attraction award in 2011, 2013, etc. * The turtle symbol resonates with Kavalan’s own story sharing values like persistence and staying power. Kavalan also takes the old name for Yilan County.